In the past two decades Black Economic Empowerment (BEE) changed so many people’s lives in South Africa, but whose lives were really changed? This book investigates all aspects of this policy. In the past two decades Black Economic Empowerment (BEE) changed so many people’s lives in South Africa, but whose lives were really changed? 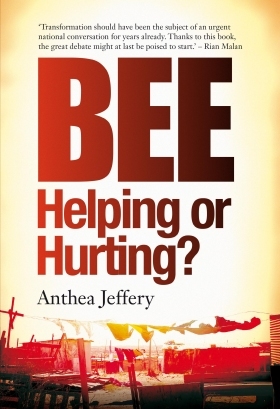 In her book BEE: Helping or hurting? the well-known political commentator from the South African Institute of Race Relations, Anthea Jeffrey, asks the daring question – does BEE work or is it placing a millstone around the neck of South Africa’s growth potential? She places the issues of BEE, the policies that currently regulate it in South Africa as well as its influence on amongst other things employment and education under the spotlight.